Hire the best live wedding bands in Cheshire, Chester and the surrounding area, to suit any event or budget. Our Cheshire bands are handpicked and vetted, giving you less to worry about on your big day. Nostalgic 90s style band playing all your favourite dance, trance and house for the party of a lifetime! Additional musicians also available. Sophisticated swing and jazz band offering Rat Pack and big band hits, as well and modern floor fillers, and a variety of line-up options. Authentic vintage band playing the jazz, blues and ragtime classics of the 20s and 30s in America. Additional musicians available. 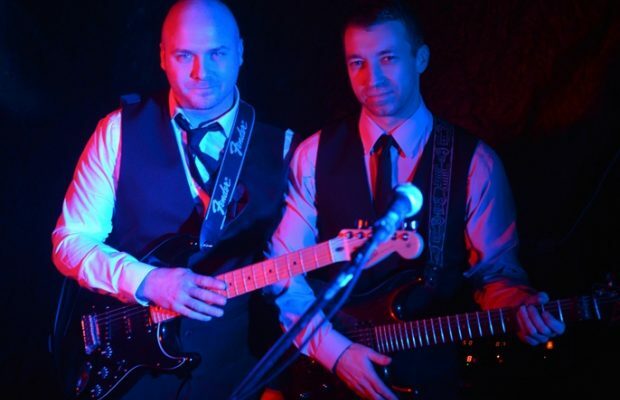 Professional and versatile rock, pop and soul function band serving the North West and beyond, covering the very best of rock, pop, funk, soul and jazz across the decades. Highly recommended! What style of music do our Cheshire wedding bands play? Typically our Cheshire wedding bands consist of between three and ten members, and perform well-known rock, pop, soul and Motown covers from across the decades, so that guests of all ages are entertained. But if you’d prefer to avoid the Cheshire cheese we have a huge range of alternative Cheshire bands for hire, including Cheshire ceilidh bands, indie folk bands and acoustic bands. With nearby Manchester’s vibrant music scene providing a wonderful selection of talented musicians, the choice is enormous! The bands listed above are ideally suited to after-dinner dancing at evening receptions, but we also have Cheshire wedding music for your ceremony or drinks party. Hire a wedding singer to set the right tone for your bridal entrance or one of our Cheshire jazz bands for toe-tapping swing music during your reception or wedding banquet. Our Cheshire string quartets, harpists, pianists and classical guitarists will create a joyous atmosphere whilst you sign the register, pose for photos or sip martinis. Whether you’re hiring a wedding band in Chester or Cheshire, you can rest safe in the knowledge that all our acts have been handpicked and fully vetted before being accepted onto our books, giving you less to worry about on your big day. Booking a Cheshire wedding band? When you book one of our Cheshire wedding bands, you don’t have to worry about a thing. They’ll provide a professional service from start to finish, and will supply all of their own equipment. Get in touch with us if you are expecting your event to be larger than 200 guests, so we can ensure that the band’s equipment is suitable. Typically our bands provide entertainment for after after-dancing, performing two 60-minute sets with a 30-minute interval. When planning your evening, 9:30pm until midnight is our recommended window for the performance. Please note that late fees can apply if the band or their DJ services are required later than midnight. Most of our are happy to play music through their PA system before and after their sets, as well as during their break. Some bands can also offer a proper DJ service, using digital software to mix the songs and take requests. Prior to the evening’s performance, the band will require a soundcheck. 5pm to 6pm is usually an ideal time, and a 60 to 90-minute window should be sufficient. It’s convenient to have a venue that’s free of guests during this time, but most of our bands can work around this with a ‘noiseless’ line-check if impractical. Our bands will gladly learn and play your first dance. Please give plenty of notice prior to the day so that the band can prepare your request. If it is not possible due to time restraints or the band’s line-up being unable to do the song justice, they will play your first dance via mp3/iPod through their PA system. For the main show, our bands require a flat and sheltered space in which to perform. The performance area should be 3x3 meters for a 3-piece band, taking allowing an extra metre per band member. You will also need to supply a power source for the band’s equipment. Our bands ask for food and drink on the day, as performing can be hungry and thirsty work! Details will be included in your booking contract. It is worth noting that many of our bands can be hired with extra services, so that you can make the most of your booking. We have bands offering jazz sets, acoustic sets, and also a DJ service so the music never needs to stop. Where do our Cheshire wedding bands perform? Our wedding bands perform regularly throughout Cheshire and beyond, including: Warrington, Chester, Crewe, Runcorn, Widnes, Ellesmere Port, Macclesfield, Northwich, Wilmslow, Winsford, Congleton, Sandbach, Nantwich, Poynton, Neston, Middlewich, Alsager and Knutsford.